The reason why I'm sharing this quote, is because I have been on a quiet and blissful, yet deep and transformative journey with this new motherhood thing. 3) We are always evolving into something new. Something happens when you try to live up to a certain image (aka 'following The Jones'), where we live in digitally social world where our lives are curated, and if you aren't living up to Pinterest standards, well you kinda feel like, f*ck, what now? With that said, I've been finally giving myself permission to have some breathing room (like, MAJORLY), as I dance through both worlds of motherhood, entrepreneurship, and being a compassionate, loving wife...without losing my sh*t.
For a desperate moment, I found myself striving to be the most attentive mamma to my little one and get back into the world of online marketing so that I could automate, automate, automate. Tighten up my funnels. Get my systems in place. Show up to all the masterminds. Create new programs. Serve my clients. Support the family business. Support my husband. Be a good wifey. Cook all the meals. Get back to dancing, surfing, self-care...all the stuff you're supposed to do to make you feel like freakin' Wonder Woman (which, I haven't had the pleasure to see, yet, because look how busy I am, people). I never fully gave myself a chance to become a MOM, like really, really, really embrace what it truly means to be a mother. A mother to this beautiful love-child, who wants nothing more than to hang out with me. How friggin' lucky am I? I've got a mini BFF who is truly coming into her own right now, and all she wants is all of my love and attention (and milk). "Why don't you just go back to spending time with Kirra full-time and paint?" All of a sudden, a huge weight lifted off of my shoulders (you know, like when you go backpacking for 11 miles straight in the blistering heat with 27 pounds of gear, and as you stop to rest in the cool-night air, you take your pack off and in an instant you're like, "Man, I feel like Neil Armstrong"). So that's why I've been away. And that's the plan. To PLAY and CREATE. To fully embrace motherhood with deep presence, ease, and grace...and to take things slooooooow. With that said, I am going to do this the best way I know, which is making a creative journey out of it. 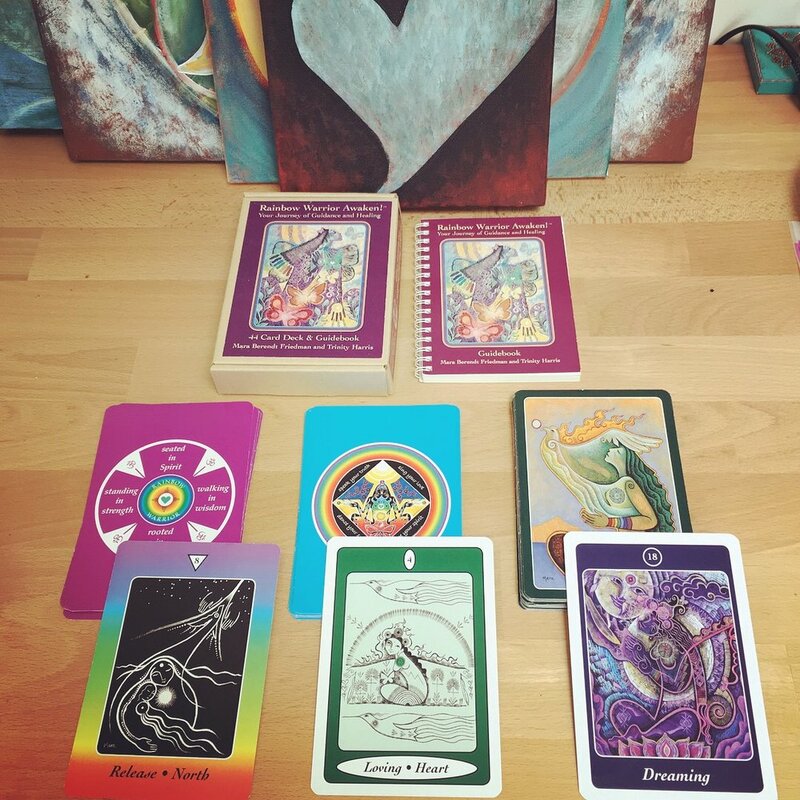 I've become somewhat of a closet oracle deck collector, and they have become essential tools in my studio for divine guidance and intuitive art-making. 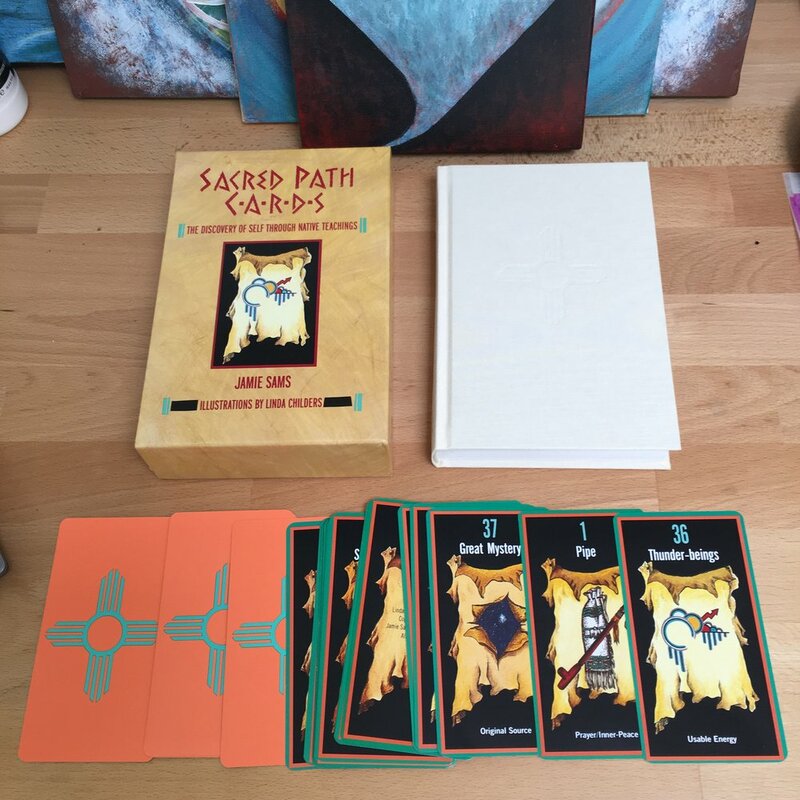 I'm embarking on the journey of creating and illustrating a set of oracle decks. I'm sooooooo excited...this is the closest thing to my dream of becoming a published children's illustrator (that will come later, when my co-author, Kirra, gets older). This passage has come across my path at the most perfect time, as I have been craving more DOWN time, to work more deeply with my art and spend more time with my little love bug (who will be my most influential muse, I'm sure). The completion of this journey might take 1 or 2 SEASONS. It might take 2 years. It might take 7 years. But what I know for sure, is that this is something that I have been seeking... to SLOW DOWN and become more of who I am meant to be. And the best way I know how to do that is through my art. This is the thing that will help me make sense of my ever-evolving transformation, from maiden to motherhood...because, rushing around, curating a #perfectlife, and trying to fit into a mold of what society expects, as a woman, a mother, a wife, a daughter, a sister, [a fill-in-the-blank], no longer works for me. This journey will keep me connected to the rhythms of Mother Earth and the galaxies above. I look forward to sharing this creative journey with you. I might disappear at moment's notice, not to be seen for weeks on end. I might bombard you with nonsensical images or words that only makes sense to my creative mind. And you might see a glimpse of me that only the closest of friends and friends witness when we are two-bottles-of-wine-deep. That said, if you are still reading this, you might be very well an inspiration and co-creator in my creative journey, too, so THANK YOU for the support while I figure out my place in the world as a new mama and evolving artist. THANK YOU for being here and for the positive vibes, my friends.